Good fishing in New Zealand. Trust this note finds you and Lilian in the best of everything and that you’ve managed to get out fishing this week. We managed a boat trip yesterday and I’ve summarised it below. I’ll send more photographs shortly. High tide was at 8.00 am so it was very close to high water when we departed. The inner harbour was covered in a calf high chop and there was the odd whitecap evident to show that the wind was steadily building in intensity. 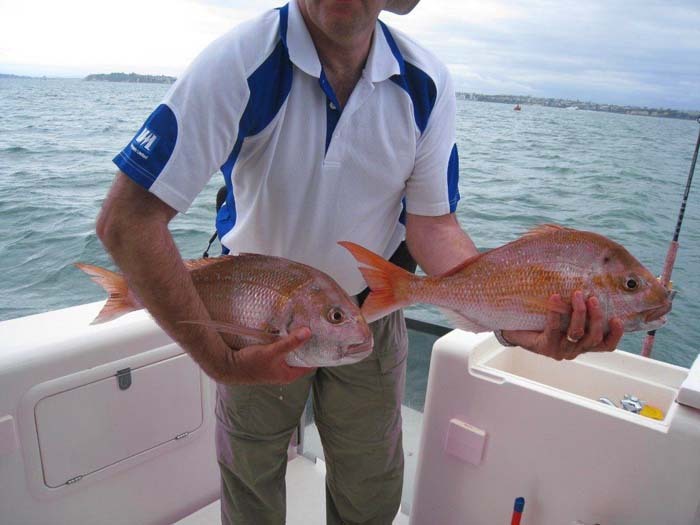 As one of the anglers is a mad keen soft bait fisherman Peter opted to drift fish initially at the edge of the Rangitoto channel and motored steadily to the shallow water close to Rangitoto island. As the boat slowed to a standstill, I sprang onto the coaming and made my way to the bow. I normally have an exploratory cast to judge the drift and make sure that when I start fishing I am casting ahead of the boat and working the soft plastic upwards towards the boat on a tight line. This first cast was spot on. For a change I’d picked the drift correctly first time (wind was dominating tide flow), the ½ oz jighead I’d chosen was sinking perfectly and the line was following the lure to the bottom exactly as I like it to do. I felt the 'Zoom' touchdown, gave it a twitch and instantly it was absolutely monstered by a heavy fish. The rod tip headed to the water as the rod arched into its graceful fighting curve and line spewed off the reel against a solid drag setting. Game on, first cast! The first run was a cracker and 60 metres of line disappeared in a blur. The fish then stopped and started shaking its head. Snapper and a good ‘un. I managed to regain some line at this point only for it to be pulled from the spool again as the fish headed off on another withering run. This time I was able to lift its head and start to work it steadily back to the boat. When it saw the boat it charged off down deep again but it was clearly tiring now and the relentless rod pressure was taking its toll. The next time it came to the surface it was spent, prone on its side and presented an easy net shot for the skipper. Ten minutes from starting the drift we had our first fish for the day, an excellent 6 lb snapper. By the time I’d dealt with the fish the wind had picked up slightly and this meant that my ½ oz jighead was now not tracking to the bottom completely. As Peter repositioned the boat to drift again along the channel edge I replaced the jighead with a slightly heavier 5/8 oz model and threaded on another Zoom Smoke shad (3”) soft plastic. As the power came off and the boat slowed to a standstill I lobbed the soft plastic ahead of the vessel as it started to drift and let the lure sink on a fairly tight line. It never got to the bottom and was unceremoniously hammered within a few feet of reaching the muddy sand. Line once again poured from the spool as this fish headed off powerfully with the outgoing tide. The line angle started to move upwards so I began to think that I’d hooked a kahawai but then the head shaking began so I knew I was fast into another good snapper. The fight was a mirror image of the first fish. Couple of strong runs horizontally and then a few powerful vertical plunges once it saw the boat. Eventually it too came boat side and was scooped into the waiting landing net. This fish was slightly smaller than the first but at a touch over 5 lb it was still a fine specimen. Two drifts for two quality snapper. It doesn’t get much better than that. By now one other chap was also hooked up on a soft plastic (I’d changed his rig and put on a 5/8 oz jighead) and one of the bait fishermen (actually a fisherwoman) was locked in a struggle with an angry 5 lb kahawai. Both landed their fish so after two drifts we had four good fish in the bin. Unfortunately the wind had continued to build and the outgoing tide had started to pick up strength. The classic wind against tide scenario. The conditions were too marginal to continue drift fishing in a launch so Peter opted to head to the back of Rangitoto island where there would be some shelter. He anchored on the edge of a shallow reef and we fished it for about 30 minutes without success. Frustrated by the lack of action he lifted the anchor and we headed around the lee of the island. As we rounded a rocky outcrop we spotted a large collection of shearwaters, fairy terns and gannets working close to shore in a sheltered bay. The water was literally boiling as kahawai and kingfish hammered through nervous balls of baitfish. The baitfish were little silvery whitebait very similar in appearance to the small Zoom Smoke shad and it was not uncommon to see them jumping out of the water to escape the jaws of the hungry predators below. Peter motored over slowly and expertly positioned the boat carefully well in front of the workup so that our drift would inevitably lead to intersection. Within minutes we were surrounded by slashing kahawai and pandemonium. One client had his soft bait slammed on the drop and was fast into a feisty, large kahawai which was pulling line like it was possessed. Eventually he managed to get it close enough to net and it was a beauty of about 6 lb. Meanwhile I’d landed another snapper of around 3 lb and began focussing on working the surface to try and connect with a kingfish or kahawai. Fast retrieves inevitably lead to follows and from high up on the bow it was amazing to see a kahawai break away from the work up to pursue the frantically fleeing soft bait only to veer away boat side. I eventually managed to hook up and I knew immediately that I was joined to a yellowtail kingfish speedster. Line simply evaporates from the spool when kingfish take off and the runs are much longer. Unfortunately the fish was only 65 – 70 cm long so it was relatively easy to subdue by applying heavy rod pressure. As it neared the boat the kingfish was being shadowed by another fish of similar size and it broke off as I grabbed the trace to lift it aboard. We drifted around the area for a couple of hours and everyone hooked up with a quality fish at some point. My highlight was watching the kahawai herd the whitebait into a ball about the size of two double beds just in front of the boat and then systematically pick off any fish that left the ball. I lobbed my soft bait near the edge of the shoal and it was monstered about 6’ below the surface. 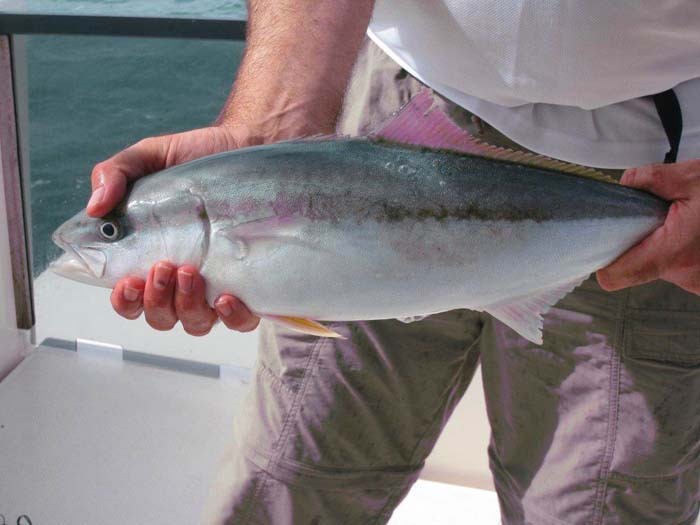 I picked it for another “rat” kingfish immediately as 100 metres of line exited the spool in the blink of an eye. It took about 10 minutes to subdue the fish and, once netted, I carefully removed the hook from its throat and a pal took its mug shot before release. 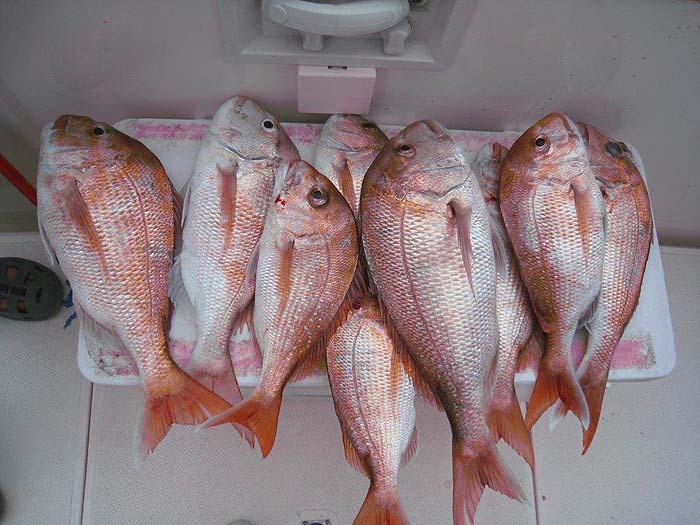 By lunchtime we had about 10 solid snapper (all greater than 34 cm) on ice in the chilly bin and one decent kahawai. 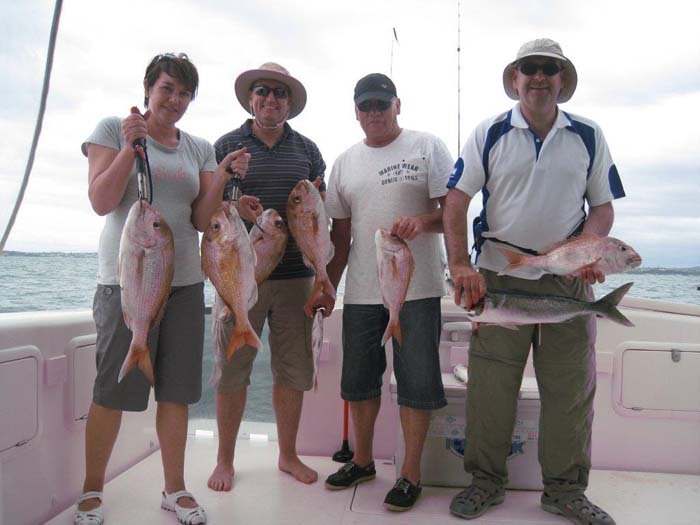 Personally I’d landed 4 snapper between 3 – 6 lb, two 3lb kahawai (both returned) and two 65 – 70 cm kingfish. Fantastic fishing! Lunch was homemade bacon and egg pie; a lettuce, avocado, feta and tomato salad; fresh crusty bread and sliced smoked ham followed by a fruit platter dominated by grapes and passion fruit. Stunning! By the time we finished lunch the shearwaters and gannets were parked on the water resting and the fairy terns had disappeared. The wind had changed direction and built up along with an uncomfortable swell which made drifting impractical. Peter opted to return to the shallow reef which we’d fished earlier as it was protected from the wind. We anchored there and again the fishing was difficult so we moved after 40 minutes to another spot close by. The bait fishermen pinned a couple of smaller (35 cm) snapper to add to the tally in the chilly bin but nothing came to plastic. Conditions had continued to deteriorate so we opted to head back to where we’d started. We tried drifting but it was uncomfortable and unproductive. The boat was probably moving too fast for our 5/8 oz jig heads to stay connected to the bottom. In desperation Peter tried anchoring in another couple of spots close in but by now conditions were marginal and we could not buy a bite on flesh or plastic so we filleted the fish and made for home. Interestingly, the two soft plastic fishermen accounted for over half of the snapper in the fish bin but they were all of the large specimens. We did not catch any fish at anchor but scored heavily when the boat was on the drift. The Zoom Smoke shad did most of the damage and it is a fantastic whitebait imitation. I tried using a white ice equivalent and it was not touched in two drifts. Matching the weight of the jig head to the drift conditions is critical and it is definitely necessary to increase the weight when the wind strength increases. Hopefully the weather holds this week as I am scheduled to fish again next Friday, weather permitting. Hopefully Peter will continue to drift but this may not happen as he is a reluctant soft plastic fisherman. Each to his own. How's that for excitement. When was the last time you had 60-100m of line stripped in a single run? When was the last time you were given home made bacon and egg pie, avocado and smoked ham instead of a crappy tuna sandwich? These New Zealanders have really got it made eh! I asked Alan a bit about the gear he was using. Here's his reply. I was using Nitro jig heads. Since I switched back to them (from the Jigstar fish shaped heads favoured by Colin Clarke) and lengthened my trace slightly my catch rate has soared. I favour a fairly benign twitch retrieve and this is ideally suited to the Nitro. Colin has a more aggressive soft bait style which may match the Jigstar head better. I should perhaps spend some time persuading Peter to soft bait fish like I do. If I improved his catch rate then maybe he’d be less inclined to use bait. ? The angler who I helped to switch jigheads thanked me at the end of the day and waxed lyrical about how much he’d learned watching me. It does make you think. Bait = small snapper. My theory is that the jigged soft plastic looks like a distressed bait fish and this is irresistible to the larger snapper. Conversely bait is snaffled quickly by the small snapper. As snapper get bigger they must home in on live prey. I dug out some information on the feeding habits of snapper and sent them on to Alan. Again he replied. Have just read the excellent information that you forwarded on what snapper feed on. In my diary note below the “whitebait” that I refer to should in fact be anchovies. I should also have clarified that bait is actually cut bait. The principal cut baits used on Friday were squid and pilchard chunks. The weather today has taken a turn for the worse. It was still and raining all day yesterday and today we’ve got scattered showers and strong wind. Hopefully it settles down by mid week so that our next session on Friday is a stunner. ? My priority for this week is to organise some more trips before the weather gets too cold and the snapper move out to deeper water. Looking forward to your computer getting back on line. Not having a computer would be worse than fishing with bait!